Jesse Stommel and Sean Michael Morris have spent much of the last 15 years thinking about digital pedagogy. Stommel co-founded the Digital Pedagogy Lab at the University of Mary Washington  and serves as executive director of the institution's Division of Teaching and Learning Technologies. Morris was Stommel's co-founder and serves as director of the Digital Pedagogy Lab. They've watched as online education has exploded, marveled as technology companies make inroads and even shifted their own thinking as new ideas supersede the old ones. 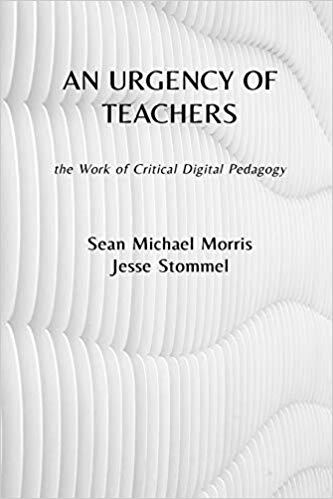 An Urgency of Teachers: The Work of Critical Digital Pedagogy  collects those observations and musings into an anthology. All of the book's 40-plus chapters are repurposed from blog posts and essays Stommel and Morris have published over the last seven years. The book is available for $9.95 on Kindle, $22.95 in paperback  or pay-what-you want for the open-access text . All proceeds go to Hybrid Pedagogy, a non-profit open access journal which originally published which many of the book's essays. "The hope was to pull together various strands of our thinking so that folks new to the work could see it in fuller context," Stommel said in an interview. "Inside Digital Learning" asked Stommel and Morris to reflect on what they've learned from constructing the book and how their insights might help others think differently about key issues in digital learning. Q: The book is made up of numerous essays. How did you assemble those essays into the final product, and what were you hoping to say by including all of them? Stommel: An Urgency of Teachers started as a curation project, more than a writing project. I began by making a list of nearly everything Sean and I had published on the web over the last seven years, together and also on our own. I quickly saw patterns begin to emerge. The idea of critical digital pedagogy is something we’ve been circling around for quite a few years -- something we’ve been writing about, speaking about, leading workshops about. What I was struck by when I looked at the body of our work over the last seven years is how clearly (at least for me) it tracks the evolution of our thinking about critical digital pedagogy -- thinking that began more as a series of juxtapositions, a series of questions. In short, what happens when the ideas of critical pedagogy sit next to conversations about teaching and learning with the web? But as I began sequencing the articles, blog posts and other writing that appears in this volume, I saw clear answers to that question emerge. The book is extensively edited, but we also wanted to reflect the various rabbit holes our work has taken us down. So there are lots of seeming tangents, the germs of ideas that help highlight the edges of the larger concepts the book explores. And while we wanted to let the ideas live as much as possible in their original form, we found that putting pieces next to each other in nonchronological order helped them take on new life. Q: What conclusions did you draw about teaching and learning as a result of crafting this book? Morris: I would say crafting this book led me to the conclusion that writing about teaching is a necessary ingredient of a critical pedagogy. I jokingly asked Jesse once, “What would Freire do?” Jesse answered: “Freire would write a book.” [Editor’s note: Paulo Freire was a Brazilian educator and philosopher who advocated in the mid-1900s for critical pedagogy.] And that’s true. Writing our thoughts -- our opinions, our research, our revelations -- is important; writing about our writing is important; and reading what we’ve written is necessary if we are to keep refining our pedagogies. Conscientization -- that critical consciousness that alerts us to our agency, and that spurs us to intervene in the world, to make change -- is only available to those capable of reflecting on their own situationality. The privilege of doing that reflecting is not easy to come by for most teachers, and I would hope that we see a rise in the support of the time, space and labor necessary for teachers to undertake it. As I mentioned on the recent Teaching in Higher Ed  podcast, I hope for this book to be a model for others to enact that reflection, and to encourage others to self-publish, not just to reflect upon and validate their own teaching, but to help raise the critical consciousness of the growing community of educators tending to critical digital pedagogy. Stommel: In addition to writing about teaching, I think it’s also important to read our own writing about teaching, and throughout this process I read and reread so much of my and Sean’s work. We write in the book that pedagogy is praxis, the movement between philosophy and practice. And that process is recursive. Which means we think about teaching, then teach, then think about that teaching, and our pedagogy emerges through that process. I also think teaching is not solitary work. I love teaching collaboratively, and I’ve had the pleasure to work in a classroom and online with folks who have changed what, how and why I teach. But I also think all teaching is collaborative in the sense that the work emerges through conversation -- between teachers, and also between teachers and students. A teaching philosophy is not something any of us can have without students. Every bit of who I am as a teacher is inflected by the dialogues I have with students. Hence, why we say in the introduction to An Urgency of Teachers that the words of the book aren’t static, the ideas aren’t finished. The goal is to spur conversation. Q: Were there topics or themes you think about differently now than you did when you wrote the original pieces? Morris: I wear a certain badge of shame for the fact that I used to claim that technology could be neutral, that any technology could be “hacked” by a user (teacher, student, instructional designer) to be useful, beneficial or put to use for social justice. I’m pretty sure that claim made it into this volume. What I’ve discovered, though -- what we’ve all discovered -- is that technology is built upon sets of assumptions, politics, biases. More Q&As from "Inside Digital Learning"
Techniques for creating an online doctoral program . Gameful design  could be the next big innovation. What virtual reality  can and should do. How to think about online teaching and design . Turnitin, for example, assumes (and profits on the assumption that) students will cheat, and against this threat it claims purview over student scholarship and labor (not to mention the scholarship and labor of thousands of indexed blogs and open-access journals). Worse, it encourages a culture of distrust between teacher and student in the classroom and online. It’s a technology that, in its employment, does harm to education. Stommel: There were just a few claims we changed significantly in the editing of this volume. For the most part, we wanted to present the pieces in all their roughness, but we’ve learned so much about the web -- and about ourselves as teachers over the last seven years. I used to lead workshops on teaching with Twitter, for example, to the point of even proselytizing. But my thinking has changed considerably about what it means to ask students or teachers to work openly on a platform like Twitter. And I approach that work much differently now than I once did. A bit of my proselytizing for Twitter is still present in the volume, but I hope that is clearly tempered by the position Sean and I have both come to in the last few years -- that tools aren’t neutral and also that tools (especially social media) are not equally safe for all users. Safety (and privacy) are not distributed equally on the web. Already marginalized people are much more likely to experience abuse on a platform like Twitter, and that fact has to be acknowledged and accounted for in our digital pedagogies. Q: What are the biggest issues/topics that have evolved from your original writing until now? In what areas did you have to rethink your perspectives or incorporate newly introduced ideas? Morris: There are several chapters in the book that focus on the MOOC. Many of these were originally written and shared in 2012 and 2013, the “years of the MOOC.” Much less is made of MOOCs now -- the hype cycle has mostly played out. Including these pieces, though, helped us raise the questions anew about what the MOOC did upon the landscape of higher education. We always acknowledged that the MOOC would be a bit of a fad, that rather than fundamentally changing education, as it was promised to do, education would probably fundamentally change the MOOC. That’s pretty much happened. But MOOCs raised important questions about teaching and learning -- specifically digital teaching and learning, distance and massiveness, the colonial endeavor of institutionalized education, the tension between standardization and what Dave Cormier referred to as “the community as curriculum ” -- and these are questions still worth asking. So, while those particular chapters look like they’re about MOOCs, they’re not … They’re still about critical digital pedagogy. But also, because the book traces an evolution of our ideas over the past many years, in some cases it juxtaposes our current thinking with approaches we took a decade ago. The most significant evolution for me has been from the critique of the learning management system (rampant in my early work) to a much more nuanced and inquiring approach of critical instructional design … And then even backwards again to the foundations of critical pedagogy and work on critical imagination as a vital literacy needed to move digital pedagogy forward. The evolution of a pedagogy is recursive, iterative. Q: What’s the biggest piece of advice you would give to an instructor who knows they should be thinking more about these issues but doesn’t know where to start? Morris: First, trust your instincts. You should be thinking more about these issues. We all should. Maxine Greene writes that “The opposite of morality is indifference -- a lack of care, an absence of concern.” We have not only a right to imagine education as if it were otherwise, but we have the responsibility to do so. And that responsibility extends not only to students, but to ourselves. To the very curiosity that brought us to our work as educators. There’s so much reading to do -- start with Paulo Freire, bell hooks, Maxine Greene, Henry Giroux, or start with An Urgency of Teachers -- but there’s also a lot of imagining to do. I encourage teachers to adopt a habitus for their pedagogy. Because pedagogy isn’t just something we enact in a classroom -- we inhabit our pedagogies, or we should. What do you honestly believe about learning? What took you from being a student to being a teacher, or a librarian, or an instructional designer? What do you fear, what you do you hope for, what do you see as possible, and what impossible thing do you want to make happen? Freire insists that reality is not inexorable. We can intervene. We can say that grades are not inexorable, learning objectives are not inexorable, the rubric, textbooks, the lecture, all those component parts of education which have been passed down to us and which we pass down. We have the agency to change them, no matter what they are. Stommel: I often advise teachers not to try to make too many changes all at once. The ideas in this book are meant to plant seeds -- some of which can (and should) take years to come to fruition. Critical thinking about technology is the first step in any sound digital pedagogy. So I encourage teachers to start by thinking (and asking students to think) about the tools they’re already using. And to realize that digital pedagogy is as much about deciding when to use tools as it is about making conscious decisions to not use certain tools (or certain tools at certain times). bell hooks talks a lot in her work about joy, and both she and Paulo Freire write about hope. The work of inspecting our own teaching has to include us asking why we teach at all? The work of inspecting our own learning has to include us asking why we need education? And I don’t think either of those discussions can overlook the importance and complexity of joy. Learning can be hard, but I just don’t believe it should be painful. Q: Which issues related to critical pedagogy have yet to be explored or could use further investigation? Morris: One easily overlooked aspect of digital learning is identity. Who is the person on the other side of the screen? Teachers and instructional designers may employ a variety of best practices to help answer that question -- the “introductions” discussion forum, for example, or the guidance that students upload photos for their online profiles, post pictures of their pets, etc. But the truth is that identity is much more complicated than how you look or the name listed in the grade book. Today’s college-age generation is exceedingly interested in identity, and in gender-fluid or trans student communities, identity is an ongoing conversation. But this is a conversation that our best practices for digital learning do not begin to address. Critical pedagogy asks that educators help students develop not only an epistemological relationship to reality, but also an awareness of their agency upon that landscape: the agency to change or be changed, to name or to be named, to claim power or surrender it. The learning management system doesn’t easily open itself to these concerns, but more importantly, the LMS makes no space for LGBTQ -- and specifically trans and queer -- identity formation. There need to be new practices developed for communication and support of trans and queer students across distance. Stommel: I think accessibility needs to be a central component of any conversation about critical and digital pedagogies. For example, folks on the internet (and at educational institutions) endlessly debate policies about laptop use in the classroom. Few of these discussions begin by addressing the key point that should make this debate a red herring. Certain students need to use certain tools because of significant learning differences or physical/psychological disabilities. No student should have to divulge their disabilities in order to receive accommodation. At the end of the day, we have to trust students to make critical decisions about their own learning. And we have to recognize that different students will (and will sometimes have to) make different choices because of their specific bodies, contexts and circumstances. In my own work, I’ve been thinking more and more about the lack of training that most higher education faculty receive before (and once) they begin the work of teaching. Thinking critically about teaching, and supporting the development work of teachers, has to be seen as an essential part of every institution with teaching as core to its mission. Faculty members don’t magically become good teachers. And higher education institutions need to honor the work of teaching by making discussions about (and recognition for) teaching a central component of every one of their systems and structures: tenure and promotion, graduate education, new faculty programming, department meetings, internal and external grants, etc.